Israeli project registered in Malta with a nonprofit fund from Switzerland most of the team of which is from the former USSR (but they're not what makes the project so interesting). Totally anonymous cryptocurrency based on the MimbleWimble protocol and written in pure C++. GitHub - 2 repositories, one of which contains wallet that (unfortunately) don't work. Alexander Zaidelson - CEO. Doesn't directly associate with the project. But does follow a few team members on Medium and even clapped two posts from the project's channel. For 10 years, served as the Vice President of WeFi. Alex Romanov - CTO. Questions about his professional qualifications: lists a number of projects he worked in, but none of them are big. His longest tenure was at Music Lab LTD (4 years). He's the project's Telegram admin. Amir Aaronson - COO. Motivated entrepreneur. Was a Co-Founder at the successful Fitch project (raised $500k), supposed makers of innovative fishing equipments: smartphone-controlled drones that dropped the float into the water. We could find neither the drones nor the app. After that, Amir continued expanding his experience as the COO of Playtness (specifically, in IWAY.VR). IWAY.VR hit the startup market in 2015. Since by then startup fever was dying out, they jumped on the blockchain wagon in 2017 and rebrand as Playtness. They ran a PRE-SALE and vanished: site doesn't work; Telegram group is deleted. Vladislav Gelfer - crossed paths with Alex Romanov at Music Lab LTD in 2014; from 2015 to 2016, worked at Viber; now works at Oncam. Specializes in C/C++, algorithmic processing of images. Artem Gorbachev - C++ Engineer. Was part of such projects as iOlite and Wings, wich combined raised around $4.3M. there, he worked with Stas Oskin (Beam's advisor). Vadim Grigoruk, Roman Strilets, Anton (Anatol) Sevostyan - group of C/C++ developers, worked together in Synesis and Tectus Media. The latter is a daughter company of an Israeli conglomerate. Marshall Ball - specialist in quantum computing and the blockchain, published 6 academic papers on the topic. Stas Oskin and Sebastian Stupurac are both advisors in: Firmo, Wings, AdEx, and iOlite. Additionally, Stas Oskin is part of Cryptics, COTI, Orbs, and 2Key - the ICO of which are active at the moment. Hope they can handle so many projects. Tal Cohen - participated in a number of projects, the latest of which is Israel's Compass Blockchain Solutions. Yonatan Ben Shimon - the project's most interesting advisor. Was caught up in the disappearance of $1.7M from the Matchpool project (raised $5.7M in 48 hours), where he was a cofounder and CEO. The day after the ICO ended, another cofounder announced he was leaving the project because Yonatan Ben Shimon took the $1.7M out of the company's wallet without explanation. The team later tried to justify this as part of their optimization strategy and published wallet screenshots. New generation of confidential cryptocurrency built on the MimbleWimble protocol. Full control of personal data. Blocks are mined via Equihash PoW. Limited token emission (~210 million). The sender/recipient addresses are not stored on the blockchain. Supports different kinds of transactions: escrow, time locked, atomic swaps, etc. No premining nor ICO, though they are doing a private sale, for strategic people. Will be supported via treasury from each block for the first 5 years (20%). Treasury goes to the company developing Beam and to the non-profit fund, which will focus on R&D and spreading information about Beam. They will create an Board of Directors with executive powers, members of which will be selected by the cryptocommunity. Developed in pure C++ by a group of professional developers. Offline transactions are supported, in which case the sender and the recipient communicate with a secure messaging system (Secure BBS). This system is fully independent and in no way tied to the blockchain. Currently, cryptocurrencies and blockchain tech are ubiquitous. Which means that the question of privacy is an urgent one. Many think that Bitcoin transactions are anonymous, but that is not the case. Currently, analytic algorithms can figure out the identity of the user. The MimbleWimble protocol was published by an anonymous author in August 2016. Confidential transactions are implemented by using hiding and binding. Each input and output transaction is a combination of the actual value of the transaction and the blinding factor, which is basically the secret key one needs to hide the actual value of the transaction. Therefore, to make a UTXO transfer, the sender must open the actual value of the transaction and the blinding factor to the recipient, who in turn must change the blinding factor to one only he knows. What's unique about this algorithm is that if the same transaction passes several users without changes, we can record just the originating and final addresses into the system, cutting out the middle ones. To verify the validity of transaction history, they suggest to only store the headers of previous blocks. This shortens the blockchain's volume. All of this means that to verify the ownership of UTXO only the the blinding factor value is needed, without having to store any addresses on the blockchain. After a transaction is created between wallets, only the commitment is recorded onto the blockchain - no personal info can be pulled from the blockchain. 1) When will the mobile app become available? 2) So what actually happened to Playtness? 3) What's the point of using Auditable Transactions in a totally anonymous cryptocurrency? 4) When are you going to release the White Paper? 5) Why is the Internal POC delayed by 2 months and will it ever get published? 6) What deposit amount must one make to become a strategic person? 7) On what platform is the Secure BBS implemented on and how exactly do you ensure its security? 8) How is the atomic swaps mechanism implemented? 9) What part of the treasury will the nonprofit fund get and which project will it spend it on? 10) Which people exactly will be on the Board of Directors and what will their duties include? 11) How much is the transaction fee and who sets it? Project raises a number of questions. It's based on someone else's idea. The team, in the 5 months of the project's existence is yet to show anything, even a White Paper. And having people with a questionable reputation on the team doesn't help matters at all. Израильский проект зарегистрированный на Мальте с непрофитным фондом в Швейцарии большая часть команды которого является выходцами из постсоветского пространства, но привносят изюминку далеко не они. Полностью анонимная криптовалюта построенная на базе протокола MimbleWimble и написанная на чистом C++. GitHub - 2 репозитория, в одном из которых лежат кошельки, которые, к большому сожалению, отказываются работать. Alexander Zaidelson - CEO. Напрямую не ассоциирует себя с проектом. Но на медиуме фоловит пару членов команды и похлопал двум постам с канала проекта. На протяжении 10 лет являлся Vice President в WeFi. Alex Romanov - CTO. Относительно профессиональной компетенции возникают вопросы: пишет, что работал на многих комплексных проектах, но из них не одного крупного. Больше всего задержался в Music Lab LTD (4 года). Админит телеграм канал проекта. Amir Aaronson - COO. Мотивированный предприниматель. Был Co-Founder такого успешного проекта как Fitch (собрал $500k), производили инновационное рыбацкое оборудование: дроны, которые забрасывали поплавок вместо рыбака, управлялось это все с мобильного приложения. Ни дронов ни приложение найти не удалось. На этом Amir не остановился и решил получить опыт работы COO в Playtness, а если быть точным в IWAY.VR. IWAY.VR вышел на рынок как стартап в 2015 году, но поскольку волна интереса к стартапам активно угасала, они решили запрыгнуть на блокчейн технологию и уже в конце 2017 переименовались в Playtness. Провели PRE-SALE и исчезли: сайт не работает, группа в телеграме удалена. Vladislav Gelfer - пересекался с Alex Romanov в Music Lab LTD в 2014 году, с 2015 по 2016 поработал в Viber, сейчас в Oncam. Специализируется на C/C++, алгоритмах обработки изображений. Artem Gorbachev - C++ Engineer. Принял участие в таких проектах как iOlite и Wings, которое в общей сложности собрали около $4.3M. Там же работал со Stas Oskin. Vadim Grigoruk, Roman Strilets, Anton (Anatol) Sevostyan - группа C/C++ разработчиков, имеют опыт совместной работы в таких компаниях как Synesis и Tectus Media, последняя в свою очередь является дочерней компанией израильской группы компаний. Marshall Ball - специалист в области квантовых вычислений и блокчейна, опубликовал порядка шести научных работ в этой сфере. Stas Oskin и Sebastian Stupurac совместно принимали и принимают участие в качестве адвизоров в таких проектах как: Firmo, Wings, AdEx и iOlite. Помимо этого Stas Oskin задействован в Cryptics, COTI, Orbs, 2Key ICO которых находится в активной стадии. Остается надеяться, что ноша будет посильной. Tal Cohen - участвовал в ряде проектов, последний из которых Израильский Compass Blockchain Solutions. Yonatan Ben Shimon - самый интересный адвизор проекта. Замешан в истории с исчезновением $1.7M на проекте Matchpool (собрал $5.7M за 48 часов) в котором он был CO-FOUNDER и CEO. На следующий день после окончания ICO один из его CO-FOUNDER заявил о выходе из проекта в связи с тем, что Yonatan Ben Shimon самолично перевел кошелька компании $1.7M без объяснения причины. В последствии команда проекта Matchpool попыталась обосновать такие действия их стратегией оптимизации и даже предоставила скриншоты содержимого кошельков. Конфиденциальная криптовалюта нового поколения, построенная на протоколе MimbleWimble. Полный контроль над персональными данными. Блоки майнятся по Equihash PoW. Ограниченная эмиссия монет (~210 миллионов). Адреса отправителей и получателей не хранятся в блокчейне. Поддерживает разные типы транзакций: escrow, time locked, atomic swaps и др. Нет премайнинга и ICO, однако private sell все же проводят, для стратегических людей. Поддерживается за счет treasury с каждого блока в течении первых 5 лет (20%). 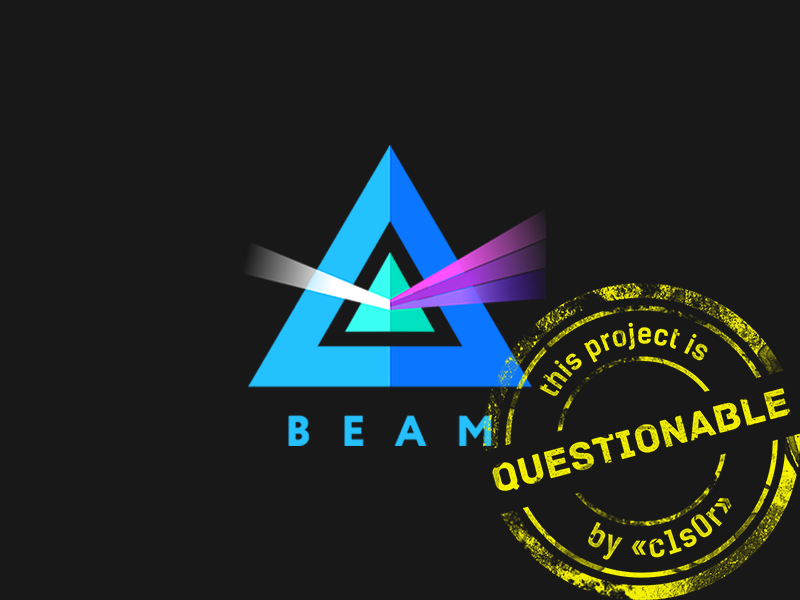 Treasury идет в компанию по разработке Beam и в непрофитный фонд, который будет заниматься исследовательской и просветительской деятельностью. Будет создан совет директоров с исполнительными полномочиями, в состав которого будут входить люди, признанные криптосообществом. Разрабатывается на чистом C++ группой профессиональных разработчиков. Поддерживаются офлайн транзакции, при проведении которых отправитель и получатель общаются через защищенную систему обмена сообщениями (Secure BBS). Данная система полностью независима и никак не связана с блокчейном. В настоящее время криптовалюта и блокчейн системы распространились повсеместно. Поэтому сейчас остро стоит вопрос приватности. Многие считают, что транзакции в сети Bitcoin являются анонимными, однако это не так. В настоящее время, аналитические алгоритмы позволяют установить личность пользователя. Протокол MimbleWimble был опубликован анонимным автором в августе 2016. Конфиденциальные транзакции реализованы за счет использования hiding и binding. Каждая входная и выходная транзакции - комбинация из фактического значения транзакции и blinding фактора, который фактически является секретным ключом необходимым для сокрытия реального значения транзакции. Следовательно, для передачи во владение UTXO отправитель должен раскрыть значение транзакции и blinding фактор получателю, который, в свою очередь, обязан изменить blinding фактор на известный только ему. Отличительной особенностью используемого алгоритма является то, что если одна и та же транзакция проходит через несколько пользователей без изменений в систему мы можем записать только начальный и конечный адреса, вырезав промежуточные. Для подтверждения валидности истории транзакций предложено хранить только заголовки предыдущих блоков. Тем самым объем блокчейна сокращается. Из всего этого следует, что для подтверждения владения UTXO необходимо только значение blinding фактора, никакие адреса в блокчейне хранить не нужно. После создания транзакции между кошельками в блокчейн записывается только комитмент, никакой персональной информации нельзя будет достать из блокчейна. Что же все-таки случилось с Playtness? Для чего использовать Auditable Transactions в полностью анонимной криптовалюте? Когда стоит ждать выхода white paper? Почему Internal POC задерживается на 2 месяца и будет ли он опубликован вообще? Какой необходимо сделать взнос, чтобы стать стратегическим человеком? На какой площадке реализована Secure BBS и как конкретно обеспечена ее безопасность? Каким образом реализован механизм atomic swaps? Какую часть от treasury получит непрофитный фонд и на какие проекты он будет его расходовать? Какие конкретно люди будут входить в совет директоров и что будет входить в их обязанности? Какой размер комиссии за транзакцию и кто ее устанавливает? Вызывающий вопросы проект, основанный на чужой идее, команда которого за 5 месяцев его существования так ничего еще и не представила, даже WP. А присутствие в команде персонажей со спорной репутацией ситуацию никак не улучшает.